Non-Americans might not get the joke here, since the figure of Smokey might not be familiar to them: he’s very much an American thing. 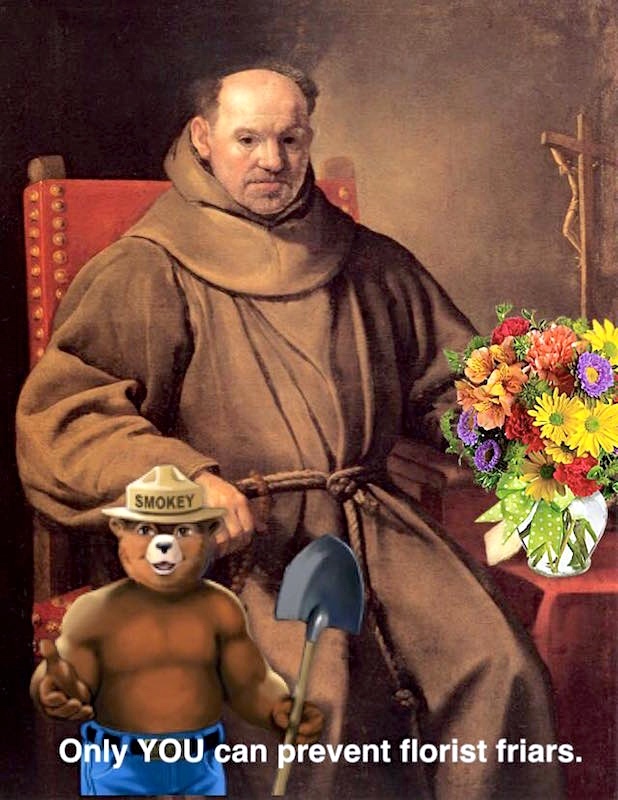 Even if you don’t recognize Smokey the Bear (and his signature quotation, “Only YOU can prevent forest fires”), you might recognize the central figure in the composition as a monk, or a (religious) brother, that is, a friar (NOAD2: ‘a member of any of certain religious orders of men, especially the four mendicant orders (Augustinians, Carmelites, Dominicans, and Franciscans)’), and you might notice the vase of flowers (such as you would get from a florist shop) and suspect that they weren’t in the original painting of the friar, so that you could appreciate the composition (with its “florist friars”) as playful nonsense. But the monitory Smokey is crucial for real understanding. A note on the genre of #1: it’s a composition that resembles a cartoon, but in which the text (rather than the image) is central. What I called, in a 5/30/14 posting, “What are they?”, texty creations (or texties for short): art works in which texts are central (Jenny Holzer, Ed Ruscha); ecards; illustrated or decoratively framed quotations; words-only cartoons, or ”slogans presented as cartoons”; captioning of existing images; webcomics that can be seen as very long captions for minimal images; Jack Handey’s Deep Thoughts (in which the images are largely irrelevant). Carlo Ceresa (January 20, 1609 – January 29, 1679) was an Italian painter of the Baroque period active mainly around Bergamo. He was active in the area of Bergamo and produced a large number of religious works characterised by a sober, understated approach combined with the vivid color of the Veneto school for the many churches and sanctuaries there. He was also a skilful portrait painter whose services were sought after by the noble families of the city. Smokey Bear (also called Smokey the Bear) is an American advertising mascot created to educate the public about the dangers of forest fires. An advertising campaign featuring Smokey and the slogan “Smokey Says – Care Will Prevent 9 out of 10 Forest Fires” was created in 1944. 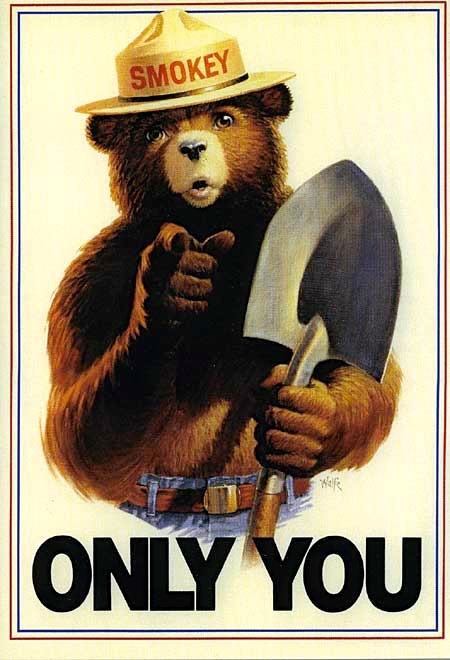 Smokey Bear’s later slogan, “Remember… Only YOU Can Prevent Forest Fires” was created in 1947 by the Advertising Council. 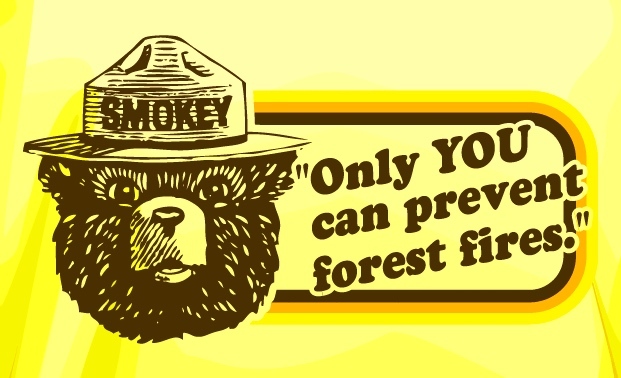 In April 2001, the message was updated to “Only You Can Prevent Wildfires.” According to the Ad Council, Smokey Bear and his message are recognized in the United States by 95% of adults and 77% of children. … The fictional character Smokey Bear, created by the art critic Harold Rosenberg, is administered by three entities: the United States Forest Service, the National Association of State Foresters, and the Ad Council. Smokey Bear’s name and image are protected by U.S. federal law, the Smokey Bear Act of 1952 (16 U.S.C. 580 (p-2); 18 U.S.C. 711). Field Marshal Horatio Herbert Kitchener, 1st Earl Kitchener … (… 24 June 1850 – 5 June 1916) was an Irish-born senior British Army officer and colonial administrator who won fame for his imperial campaigns and later played a central role in the early part of the First World War, although he died halfway through it. 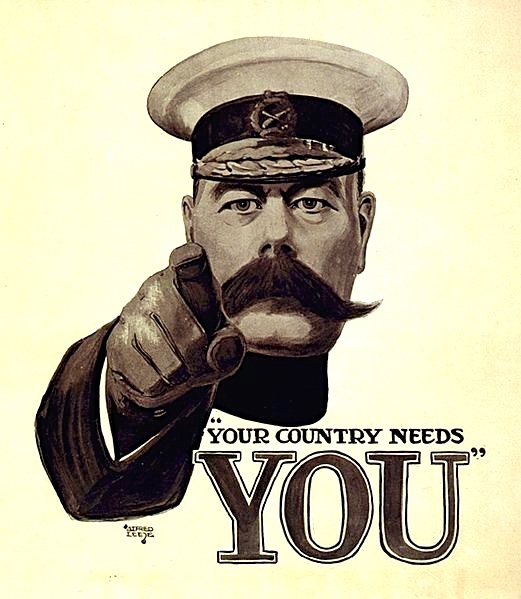 … Kitchener stated that the conflict [the Great War] would plumb the depths of manpower “to the last million.” A massive recruitment campaign began, which soon featured a distinctive poster of Kitchener, taken from a  magazine front cover. It may have encouraged large numbers of volunteers and has proven to be one of the most enduring images of the war, having been copied and parodied many times since. Uncle Sam (initials U.S.) is a common national personification of the American government or the United States in general that, according to legend, came into use during the War of 1812 and was supposedly named for Samuel Wilson but whose actual origin may be obscure. 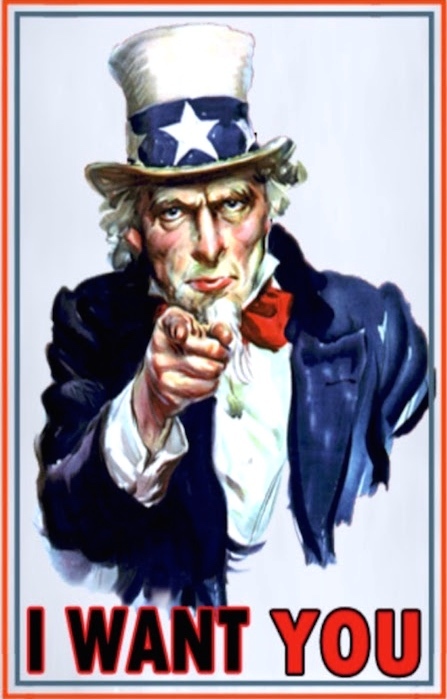 Uncle Sam represents a manifestation of patriotic emotion (of people in America for the country in which they live). ,,, Uncle Sam didn’t get a standard appearance until the well-known “recruitment” image of Uncle Sam was created by James Montgomery Flagg (inspired by a British recruitment poster showing Lord Kitchener in a similar pose). It was this image more than any other that set the appearance of Uncle Sam as the elderly man with white hair and a goatee wearing a white top hat with white stars on a blue band, a blue tail coat and red and white striped trousers. The image of Uncle Sam was shown publicly for the first time, according to some, in a picture by Flagg on the cover of the magazine Leslie’s Weekly, on July 6, 1916, with the caption “What Are You Doing for Preparedness?” More than four million copies of this image were printed between 1917 and 1918. The version incorporated into #1 replaces the pointing finger with an appealing hand (but preserves the shovel) and of course uses the full quote, so that it can be playfully varied, with florist friars for forest fires. This entry was posted on February 1, 2016 at 1:27 am and is filed under Formulaic expressions, Language play, Linguistics in the comics, Truncation. You can follow any responses to this entry through the RSS 2.0 feed. You can leave a response, or trackback from your own site. The friar’s rough brown cloak identifies him as a Franciscan, the best-known friar. There’s a long involved joke about a cannibal who ate a missionary and got sick – boiled him in that ancient cartoon meme, a huge iron pot – and the witch doctor told him that’s why his meal didn’t agree with him, don’t you know Franciscans are fryers?